We’d love your help. 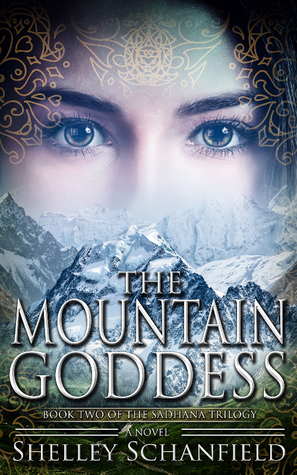 Let us know what’s wrong with this preview of The Mountain Goddess by Shelley Schanfield. When beautiful warrior Dhara masters yoga’s supernatural powers she captures the heart of Siddhartha, the prince prophesied to rule the world or become the greatest sage of all time. But her lust for earthly power clashes with his quest for inner peace. If he leave A beautiful warrior princess. A tormented prince. A terrible choice between love, duty, and spiritual freedom. When beautiful warrior Dhara masters yoga’s supernatural powers she captures the heart of Siddhartha, the prince prophesied to rule the world or become the greatest sage of all time. But her lust for earthly power clashes with his quest for inner peace. If he leaves his kingdom to seek enlightenment, he risks destroying his people. Only Dhara can convince him to stay. The Mountain Goddess, the second book in the Sadhana Trilogy, is set in the fascinating world that gave birth to yoga and Buddhism. To ask other readers questions about The Mountain Goddess, please sign up. Choices to be made. Love, duty and freedom. Dhara wants to learn from the yogi Mala who is a strange women and is known to have violence in her past. Dhara leaves her clan to go to Mala. Dhara has quite a journey meeting Siddhartha along the way. Both have exceptional mental capabilities and martial arts. Dhara is enchanted with power. This doesn't set well with her husband who just wants a solitary life. Since Siddhartha doesn't want this worldly power and pleasures it brings, she becomes the warrior. The have a son. Siddhara is very unsettled. He wants to find peace but if he leaves to do so he could destroy his family. How can he be convinced to stay and who can do it? This world that The Mountain Goddess is set in gave birth to yoga and Buddhism. If you like fantasy and historical epics this may draw you in. The book has females that are strong willed and you get a female's look at things. A different world, a different time but some connections to our world, our time. This is the second book in this trilogy and I enjoyed having the opportunity to be able to read the first book in this series, The Tigress and the Yogi. In this book, Dhara who is a princess warrior, masters these supernatural abilities, meanwhile, she steals the heart of this prince warrior who is to foresee over the entire world. This story starts out with a magical story that is fun to read that leads into Buddhism. Interesting and fun read. Not a story I would typically pick up to read but I This is the second book in this trilogy and I enjoyed having the opportunity to be able to read the first book in this series, The Tigress and the Yogi. In this book, Dhara who is a princess warrior, masters these supernatural abilities, meanwhile, she steals the heart of this prince warrior who is to foresee over the entire world. This story starts out with a magical story that is fun to read that leads into Buddhism. Interesting and fun read. Not a story I would typically pick up to read but I did enjoy it. This is a fantasy read - which may be why I didn't enjoy it as much as I was hoping to, but I like to expand, or at least attempt to expand my reading taste. This just wasn't it. And that isn't to say that a lot of people won't enjoy this read because for those that enjoy this genre I am sure will enjoy this book/trilogy. While pursuing a black belt in Tae Kwon Do, Shelley Schanfield became fascinated with the Buddhist roots of the martial arts. By profession a librarian, she dove into the time, place, and spiritual traditions, including yoga, that 2500 years ago produced Prince Siddhartha, who became the Buddha. The stories of the Buddha’s first women followers inspired her to write The Tigress and the Yogi, the f While pursuing a black belt in Tae Kwon Do, Shelley Schanfield became fascinated with the Buddhist roots of the martial arts. By profession a librarian, she dove into the time, place, and spiritual traditions, including yoga, that 2500 years ago produced Prince Siddhartha, who became the Buddha. The stories of the Buddha’s first women followers inspired her to write The Tigress and the Yogi, the first novel in a trilogy focusing on women’s spiritual struggles and journeys. Shelley hung up her black belt to practice Iyengar yoga. Both disciplines have enriched her world and the world of her novels.